The idea of leadership abounds in management discourse; less so in project writing, but here in some ways it is more important: the breakdown of leadership can have immediate and disastrous consequences for the project, its staff and its investor. Leadership needs to be made tangible. It is not just about the fluffy aspirational manipulation or which we read too frequently, and can do nothing with. It has to be grounded in actions and organisation. 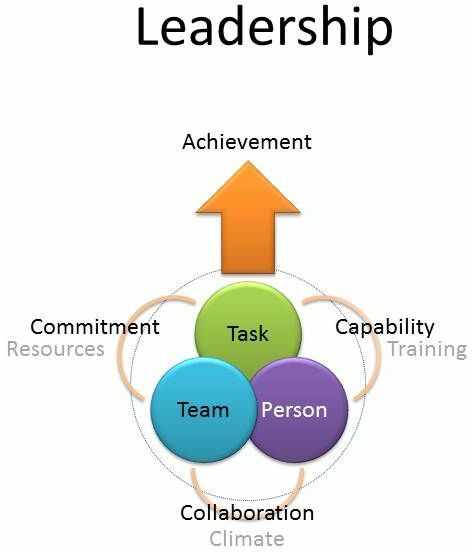 I think John Adair's Action Centred Leadership model achieves this very well, and is directly applicable to a project environment. It requires a dynamic balance (dynamic means changing as per the circumstances) of task, team and individual, with none slipping out of the dynamic.